I was using a pretty lame technique to move the background starfield under the player’s ship and the more I struggled with it, the more I saw its flaws. I had 4 panels, each was the same size as the game screen and a pretty nice starfield pattern. I would move the panels according to the ship’s velocity and direction. When one panel went offscreen, I would move it to the opposite side so it could be re-used. My primary flaw in logic was that I had a cyclic error when testing to see if the panels’ x,y coordinates were less/greater/equal to the boundaries of the game. I’d detect that panel 1 was off-screen, then place it in a position where it would then get picked up by another off-screen check and guess what? You’d never see that panel again. The equal-to part of the check was the main problem. Anyway, I decided to use two overlapping randomly-generated starfields instead. My offscreen checks are now nice and tight, and I can get funky with what happens in those checks (like change the star’s color or whatever). The double-starfield looks sweet, too. The top layer has 3-pixel stars and the bottom has 1-pixel stars. The bottom layer moves a bit slower. The effect pleases me. I am pleased. Yes. The ship is ripped off from Lost Garden’s free game graphics collection. I highly recommend Lost Garden for anybody noodling about in the indy game cosmos. I’m probably going to use some of my kids’ art as soon as I get it digitized, or they’ll make some for me on their ‘puters. 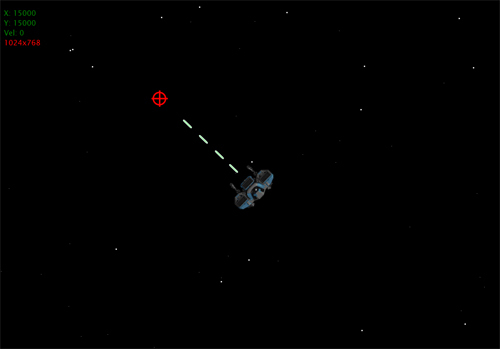 – Click yer left mouse button to fire, use your mouse to aim/steer. – Press W to accelerate, S to decelerate. I don’t have fancy physics worked out so that your velocity/direction is dampened correctly when you turn and burn. – I don’t have thrust sound or graphics yet. – The laser shot sounds get clipped occasionally. Still working on that. – The stars are really cool. Just keep that in mind. – Be careful using Silverlight in Firefox (especially FF3, apparently). I’ve seen it crash several times, and not on my stuff, but on the official Silverlight.net site mostly. – This build was made with Silverlight 2 Beta 2.